Click the covers to enjoy! Will be inducted into the World Golf Hall of Fame with ceremonies in New York in September 2017. Lorena played in the 2001 LNGA Amateur Championship held at Fargo Country Club, Fargo, North Dakota. She was the runner-up to Virada Nirapathpongporn. She was awarded the Amateur Medalist with qualifying rounds of 69 – 72 / 141. Lorena and teammate Ali Martin Del Campo represented Guadalajara Country Club and won the Howell Team Award for their club. LNGA takes great pride in our collection of scrapbooks, minutes, record books, films, photographs…name it, we have it. When the USGA asked associations such as the LADIES NATIONAL GOLF ASSOCIATION for records to become a part of the permanent USGA Museum Collection, we delivered. Our LNGA donation is now a part of this collection; it was digitized in 2014 and made available to the many researchers who use the USGA resources annually when the need arises. 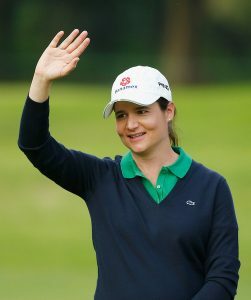 The USGA hopes to utilize the digital images through a web-based exhibit that will highlight women and golf which could potentially be seen by golf fans around the globe through the Museum’s digital and media programs. Thank You to the women, like our own Wilma Gilliland, for preserving our past and present and for making us aware of our responsibility to continue. The LNGA accepted a certificate from the USGA acknowledging our contribution. Click here to view it. We will keep you informed on the progress of this achievement. 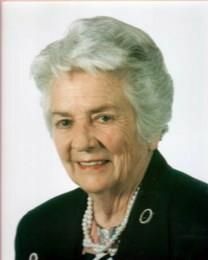 A former Ladies National Golf Association National Amateur Champion winning in years 1969 and 1971 before her marriage to Michael Booth, passed away surrounded by family following an extended illness. She is survived by her husband of 46 years, Michael Booth, and her daughter, Kellee Booth. She was preceded in death by her parents Louis A. Bastanchury and Emily Erramouspe Bastanchury. Jane was born on March 31, 1948 in Los Angeles, CA. She was introduced to the game of golf by her father, Louis, and went on to be an accomplished amateur golfer. She attended Arizona State University where she won a National Intercollegiate Individual Title in 1969. Jane represented the United States in three victorious Women’s World Amateur Teams (’68,’70,’72) and Curtis Cup Teams (’70,’72,’74). She won three Ladies National Championships (’67,’69,’71), three consecutive Broadmoor Invitational Championships (’68,’69,’70), two Women’s Western Championships (’69 and ’70), and five other Amateur tournaments in 1972 and 1973. Jane also finished in the top-10 in three US Women’s Open Championships, including finishing 3rd in 1971, 6th in 1972, and 9th in 1974. After her playing years, Jane and her father ran the Southern California Jr. 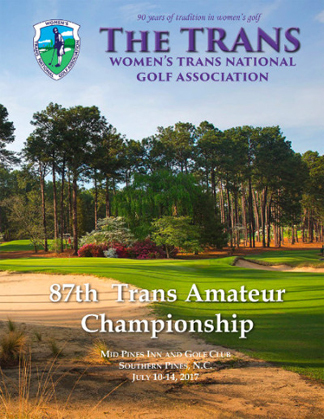 Golf Association and its extensive tournament program until the early 1990s. Jane was inducted into the Arizona State University Hall of Fame, the SCPGA Jr. Golf Hall of Fame, the NCAA Intercollegiate Hall of Fame, and the SCGA Hall of Fame. She was Captain of the victorious 2000 US Curtis Cup Team, the first U.S. win on British soil since 1984. She also received the Ike Grainger Award for 25+ years of service on the USGA Girls Jr. Committee. She resided in West Palm Beach with her husband since 1999. Our last visit to Mid Pines was in 2005 when we conducted the LNGA Amateur. 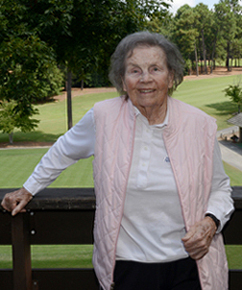 Peggy Kirk Bell welcomed the LNGA with open arms and was a frequent visitor to see many of our players on the course. Peggy welcomed the LNGA and spoke to many players. She enjoyed passing on a few of her classic reminders of a proper grip and her approach to playing a course. She never tired of talking to the players. She was gracious and watchful, looking for those complete swings, as she often said. For more information about this remarkable lady, CLICK HERE. Ed Dell Wortz served as LNGA President in 1952. Ed Dell Wortz, of Fort Smith, passed away November 4, 2016. She was born November 16, 1922, in Fort Smith, to Carl Henry Wortz and Ed Dell Haglin Wortz. Ed Dell graduated from Stephens College in Columbia, MO and the University of Arizona in Tucson. 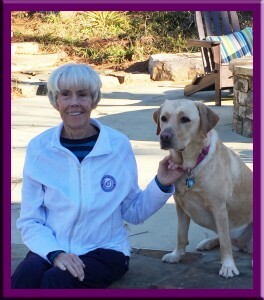 She also attended Wharton School of Finance in Philidelphia, PA. Ed Dell retired as a broker for Merrill Lynch, was a member of First Presbyterian Church, and she enjoyed golf and community activities. 1. Ed Dell was a great friend and will be missed. She contributed her talents to Junior Golf, and Golf in general. She was one to be “counted on” to help raise funds for needy causes. 2. Ms. Wortz was a Great woman. She was not only my mom’s employer of 50 years but also her friend. She will be missed. May your soul rest in peace in Heaven. 3. Ed Dell was a wonderful, interesting person. She did a lot for the Fort Smith Museum of History in the Old Fort Museum days. You will be missed. You were among many great ladies at the “Old Fort Museum” that encourage my love of history. 4. I helped Ms. Wortz with her parties and boy did she love to have parties. A was a great Hostess. She also loved her dogs as did we all. She had a great life and she will have been missed already during her illness. I know she had everything laid out for you because she was also an organized person. God Bless you. 5. Ed Dell took me under her wing when I took up the game of golf! I learned a more from her about the proper way to play the game! She was a great friend to all, whether two-legged or 4 legged! She will be missed by all! May the good Lord bless and keep you. It is with a heavy heart that we announce the passing of Bruce Gilliland, husband of our newly announced Honorary Director and longtime member of the LNGA, Wilma Gilliland. Bruce and Wilma were married for 73 years. Bruce’s contributions to golf began in 1966 when the Kimball, Nebraska City/County Park, and Recreation Board was formed and decided to build a Complex complete with 4 Baseball Fields, Archery Range, Trap Club, Tennis Courts and of course a golf course. Bruce designed 9 holes and with help from hired contractors, the original 9 was completed in 1969. Bruce did all of the surveying, design and a lot of the manual labor. The second 9 was completed in 1993. Once again Bruce did all the surveying, design and a lot of the manual labor, but this time very little outside help was used. Bruce and his gang of young men also converted the original manual watering system with a fully automated system. Every day you could see Bruce down in a trench helping the boys with a fitting or a valve or simply hand digging the trench. One day Bruce and Wilma were driving home from a trip and were talking about the congestion that the Junior Golf program caused around the Pro Shop, putting green and driving range. Bruce told Wilma ‘You get the money and I will build it’, well they did and he did. In 1995 they applied for a Junior Golf Grant from the United States Golf Association and received $35,000.00. Bruce built 2 greens and a driving range tee, one of the greens even has a sand trap beside it. Later he even designed and built a gazebo beside the Junior Golf building. There is never a charge to play these holes and Juniors have priority. It is a great place to practice your short game and many times you will see adults with children playing a few holes. 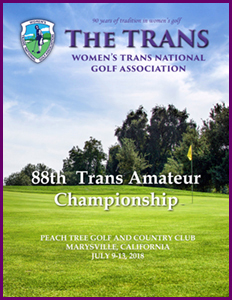 For 21 years Bruce was the volunteer Scoreboard Printer for the Ladies National Golf Association and also did the scoreboard for the USGA Women’s Amateur Public Links Championship for several years. Bruce was a founding member of the Kimball Rotary Club and a member of the Kimball Country Club since 1961. 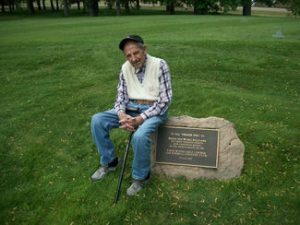 He was a founding member of the Nebraska State Sand Greens Golf Association, Co-founder of the Panhandle Golf Association and a Lifetime Member of the Nebraska Golf Association. She was our friend, our co-worker, our Amateur Championship Director. 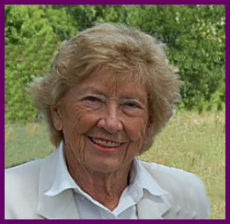 Merilee Giddings passed away on December 29. She was a treasure that will be missed by each and every member of the LNGA Board. We thank all of you for extending your thoughts and prayers to her through her CaringBridge site. She fought to the end and with the same grace and patience that we witnessed from her throughout our years of friendship; she never complained just faced her destiny along with her dear friend pictured here, Phoenix. We will miss her smile, her knowledge of golf, her undying need to make sure the player has presented a well-defined venue for each and every championship. In her mind, the player came first. She was a classy lady and our hearts are broken.